Whether you wish to take your horse on holiday or you are travelling to compete out with your own locality, we make it easy for you to find grazing and a comfortable stable. The accommodation on offer for equines ranges from grazing only, to stables old and new including loose boxes built over a hundred years ago, to brand new American Barns. 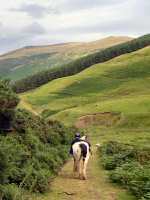 Horses Welcome B&Bs have been assessed to make sure that your horses needs are catered for. Many have accommodation for riders on site so that you can keep an eye on your trusty steed and others provide accommodation nearby. Take your pick!